February and March have been pretty wet this year to say the least. according to my rain gauge, we have had 37.75″ of rain to date here at the nursery. Our average annual rainfall is 22″-24″ here. And looks like a bit more on the way. The late season moisture is keeping things green and the ground soft (although at times kind of muddy) and making for excellent gardening weather as soon as the rain stops. My long range forecast for the next 15 days shows the warmest day to be 72 and mostly in the 60″s. Perfect weather for planting and enjoying, especially when the sun does come out. Deciduous trees and shrubs are starting to leaf out. A bit late this year. The cool weather is nice. Looks like the rain will be scattered after this week. Not deluges. Daffodils that were blooming earlier are now done here at the nursery. After they are done blooming, don’t cut off the leaves while they are still green. While the leaves are green, fertilize them with a high phosphorous fertilizer or one labeled “bulb food”. They bloomed early this year but here at the nursery the leaves are still green and the fertilizing can still be done. Hopefully it is the same with yours. The old leaves can be pulled up when they have turned yellow or brown. If you haven’t fertilized yet, it is time to do it. With the moist ground and the cool temperatures it is an excellent time to fertilize your landscape. An all purpose fertilizer will work for trees and shrubs. Citrus fertilizer for citrus trees. And an acid fertilizer for rhododendrons, azaleas and camellias as well as blueberries. If you planted any bare root fruit trees this year or last year, the trunks of the trees should be painted with white tree trunk paint so that the young, thin bark does not become sunburned and cracked allowing insects to damage the cambium layer which carries nutrients to all parts of the tree. Do not use an oil based paint. A light colored, water based latex paint diluted by 50% works well. Also, due to the cool March, some trees are starting to leaf out late. Don’t give up yet on them. Apples and Cherries in particular are slower than other trees to break dormancy and with the cooler spring may be late leafing out. They have not started here yet but should in a week or so. So depending on where you live, may be still dormant. It will soon be the optimal time to plant your vegetable garden because the soil will be warming up more quickly as the night time temperatures are not so cold. 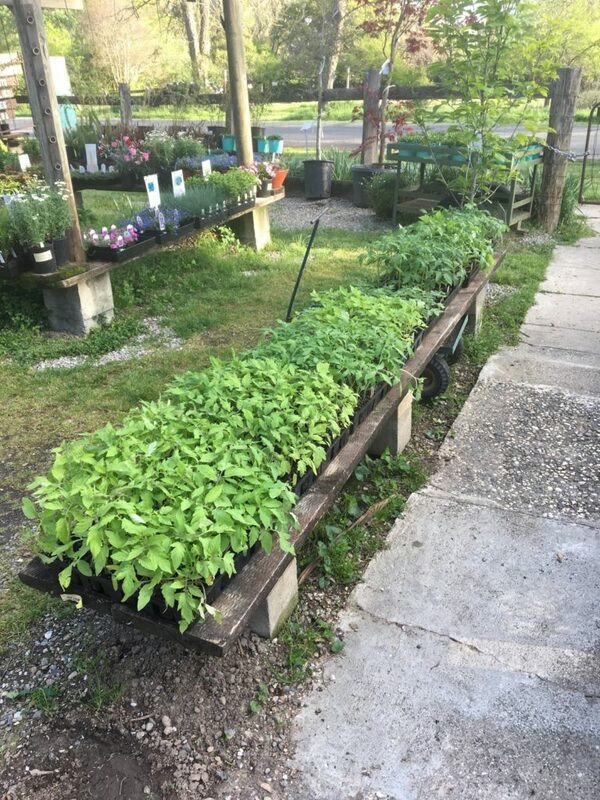 We have a large selection of vegetable starts and seeds now in for planting and get restocked every week on Wednesdays and will continue to stay well stocked on vegetables through the spring season . Seedling plants as well as seeds should do well in the warmer soil, so plan your gardens. The root vegetables such as radishes, carrots (we suggest the short stubbier carrots in the areas with heavy clay), turnips, and beets should do well, too. When planting corn in your veggie garden, keep in mind that the pollen transfer is by the wind, so corn should be planted in blocks of parallel rows – not in a single row. If you run your rows north south, then that is the prevailing direction of winds and will help with pollination. In preparing your garden use a vegetable fertilizer and be sure to add calcium to prevent blossom end rot on tomatoes and squash. I also add kelp meal and bone meal which helps with disease prevention (the kelp meal) and helps with faster root development (the bone meal). Mulch your vegetable garden with compost or straw which will help control weeds and reduce the water you use. With a good layer of mulch, you can give a good soak to your garden about once a week during the cooler spring and maybe twice a week during the hot part of the summer. I used straw from cleaning the barn on my garden and it works very well. One customer said she used alfalfa as mulch and you get the benefit of the calcium and nitrogen as the hay breaks down. Something to consider. We have fruit trees that were potted in January now available. They are in paper pots so can be planted pot and all. Assorted varieties. $32.00 each. We are having a very nice and somewhat wet spring this year. Take advantage of the moist ground and cool but not cold weather and get some planting done. Enjoy the spring in your landscape and garden. We will be closed Easter Sunday, 4/21/19.